I don’t know why more people don’t make barley as a side dish more often. It’s a perfect alternative to rice or potatoes, much better for you, incredibly yummy, and almost ridiculously cheap! You can infuse almost any flavour you want with fresh herbs and it takes far less effort than mashing up a pot of potatoes. It’s also not a fussy dish- you literally just chuck it in and wait until it’s tender. For measuring purposes remember that 1 cup of raw pot barley will give you about 4 cups of cooked and if you make it with beef or chicken stock instead of water- you’ll end up with an incredibly savory side dish. 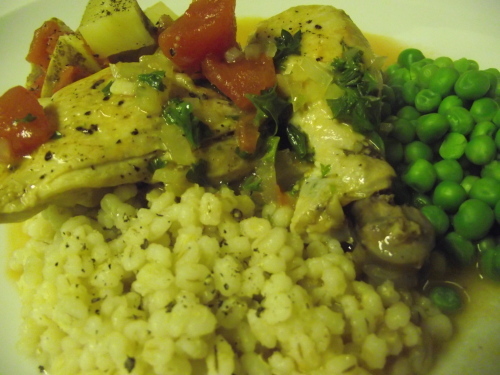 I’ve have used this barley recipe and can confirm it goes very well with these dishes – Wine Braised Short Ribs and Hungarian Paprika Chicken. Bring the stock to a boil add salt & pepper and barley and simmer on medium heat until tender (about 20 minutes.) Unlike rice, all of the liquid may not be absorbed when it’s ready. Add any fresh herbs that you want in the last couple of minutes of cooking and serve immediately.